"Death comes for everyone . . . I'm not afraid of dying. But I am afraid of dying here . . . I'd rather die on an adventure than live standing still." "I'm not going to die," she said. "Not till I've seen . . . everything." What do you get when you mix equal parts magic, inter-dimensional travel, strong female characters, and criminal activity, with a hint of romance? A Darker Shade of Magic, of course! I was drawn to this book because 1) it's been super popular among the Instagram reader community, and 2) there is not one, but four Londons (mega points for creativity, Schwab). What did I like about this book? Well, the whole premise was highly original. 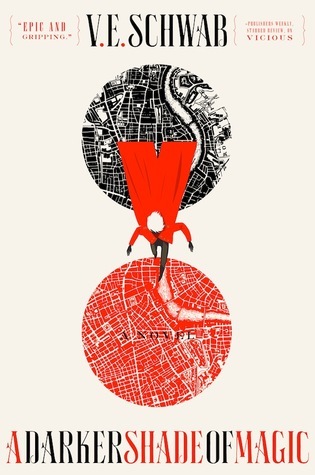 Kell, the main character, can travel between 4 Londons—White London, Red London, Black London, and Grey London. Each London has a different relationship with magic, whether they embrace it, worship it, kill for it, or don't believe in it (not in that order). But Kell and one other character are the only ones able to travel between the Londons, which means they are messengers and ambassadors for the leaders (which leads to some interesting problems). I also liked that the book wasn't all about romance—there was very little. Lila and Kell worked as a team. The book also dealt with brotherly relationships and caring for family, even if they are not your blood relatives. It also tackled the age-old question of "what do you do if you come into a lot of power, but it's an evil power," which naturally includes character motive investigation, willpower, and self discovery. 1) Dialogue – I didn't feel like it flowed naturally and was a tad cliche. 3) Character/plot originality – Although the premise was unique, much of it felt like other YA lit fantasy that I had read before and that was better executed (e.g., Leigh Bardugo's Six of Crows and the Grisha trilogy). 4) World building – I wanted more details. I can never have too much solid world building, and I think it's essential for fantasy to connect with the reader. Overall, a fun read, but not quite a 4-star rating.